Three United Nations Conventions provide the international legal framework on drug control, instructing countries to limit drug supply and use to medical and scientific purposes. Yet, debate is increasing on the legalisation of drugs for non-medical purposes, particularly cannabis. Models under development for the legal supply of cannabis are described in this analysis, as well as some of the questions they raise. The international legal framework on drug control is provided by three United Nations conventions, which instruct countries to limit drug supply and use to medical and scientific purposes. Nevertheless, there is increasing debate over legalisation of drugs for non-medical purposes, and of cannabis in particular. Such proposals raise concerns over increases in use and harms and questions about the ways in which the distribution of cannabis for non-medical purposes could be carefully regulated to mitigate these. In the EU, a system of limited distribution has evolved in the Netherlands since the 1970s, with further developments in the last few years. Detailed proposals for non-medical cannabis regulation were initiated in two states in the United States and in Uruguay at the end of 2012, which entered into force in 2014, the year when two more US states and Washington DC voted to allow for the supply and distribution of the drug. These are different models that are being closely observed to understand the advantages and disadvantages of a particular regulated system. In addition to these systems, the model of ‘cannabis social clubs’ has been increasingly mentioned in drug policy debates. Its advocates argue that policies of non-prosecution of individuals in some countries can be equally applied to registered groups of individuals, to effectively permit a closed production and distribution system. At present, the model is rejected by national authorities in Europe. In the Netherlands, the cultivation, supply and possession of cannabis are criminal offences, punishable with sentences including prison. However, a practice of tolerance, first set out in local guidelines in 1979, has evolved into the present-day concept of ‘coffee shops’, cannabis sales outlets licensed by the municipality. About two-thirds of municipalities do not allow coffee shops, and the number of coffee shops across the country is steadily decreasing, from 846 in 1999 to 614 in 2013. The sale of small quantities of cannabis to over-18s in coffee shops is tolerated in an attempt to keep adults who experiment with cannabis away from other, more dangerous, drugs. 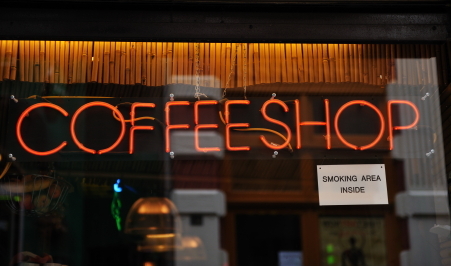 The coffee shop may be closed down and the operator or owner may be prosecuted if he or she does not meet the Prosecutor General’s criteria, which prohibit advertising, nuisance, sale to minors or non-residents, and sale of hard drugs or alcohol, and limits sales to 5 g per transaction. A scheme to convert coffee shops into closed clubs with registered members was trialled and then dropped in 2012, but from January 2013 coffee shops were restricted to residents of the Netherlands only, to be proven by identity card or residence permit. Nevertheless, implementation and enforcement of this rule varies by municipality. A proposal to limit coffee shop sales to cannabis products with THC levels of under 15 % remains pending, as enforcement issues are addressed. No more than 5 g per person may be sold in any one transaction and the coffee shop is not allowed to keep more than 500 g of cannabis in stock. Yet wholesale cultivation and distribution of cannabis is not tolerated in the Netherlands, resulting in what is known as ‘the back-door problem’, i.e. drugs may be sold at the front but not supplied at the back. Although there have been many discussions on this inconsistency, to date no solution has been agreed. Alongside the coffee shop system, cultivation and possession of small amounts of cannabis (up to 5 g) for personal use will in principle not be prosecuted. An evaluation of Dutch drug policy in 2009 found that the coffee shops were the main source of cannabis for users (but not the only source), the markets for soft and hard drugs remained separate, and adult cannabis use was relatively low compared to other European countries. However, underage use was high (whether due to coffee shops, greater acceptance of use, or other factors), there was serious nuisance from drug tourism, and the sector is increasingly commercialised and of interest to organised crime (1). The most recent legal developments were partly in response to this evaluation. On 1 March 2015 a new article to the Opium Act came into force, prohibiting activities that prepare or facilitate the illegal cultivation and trafficking of cannabis. In 2012, US voters in Colorado and Washington State approved proposals to establish state-wide systems for the regulated distribution of cannabis for non-medical purposes (as distinct from the ‘medical marijuana’ systems that already existed in 18 US states). The systems’ stated aims are to free up resources to fight violent and property crimes, regulate the visible trade and gain tax revenue from that trade. As in the Netherlands, the systems utilise licensed outlets, establish age limits (21 years, as for alcohol), restrict advertising, limit personal possession (to 1 oz/28 g) and prohibit use in public. Unlike the Netherlands, they establish a state licensing system for production and processing to supply the outlets. The systems became operational in Colorado in January 2014 and in Washington State in July 2014. Implementing rules have been established with parallels to alcohol and tobacco regulation. Both states had pre-existing medical cannabis industries. And in the case of Colorado the constitutional avenue through which non-medical cannabis was legalised and the existence of a powerful medical cannabis industry has impeded the development of strict regulations that are designed primarily to protect public health. To date, no significant reports from Colorado or Washington State suggest that initial concerns about increased crime, motor vehicle accidents and lost productivity have come to pass; long-term health and social impacts will require more time to be properly assessed. It should be made clear that in both states loosely regulated medical marijuana had already existed for several years, making these legal changes more gradual than they appear. Some health professionals have raised legitimate concerns about the sale of some very potent edible products. For the calendar year 2015 Colorado reported USD 114 million revenue from taxes and licence fees, while Washington State reported approximately USD 129 million. In November 2014 the states of Oregon and Alaska voted in favour of similar regulatory systems, while Washington DC voted for a system that would legalise only home growing and non-commercial transfer of up to 28 g (i.e. no sales outlets). Again, medical marijuana markets had existed in each of these jurisdictions, reinforcing the fact that the move toward legal non-medical cannabis is not made in a single leap. In Oregon medical marijuana dispensaries can sell non-medical marijuana from October 2015 until the end of 2016, when separate shops will be licensed; in Alaska, unlike the other states, retail and on-site consumption (‘coffee shops’) are planned. These state-wide systems are in direct contravention of US federal law, where both possession and supply of cannabis are criminal offences. The US Department of Justice issued guidance in August 2013 directing federal prosecutors to prioritise eight enforcement areas, including sale to minors, revenue going to criminal gangs and diversion to other states (2). Beyond these areas, the federal government will rely on states to enforce their laws. Further guidance was issued in February 2014 for financial institutions to provide services to marijuana-related businesses (3); this is also a federal crime but the resulting sizes of cash transactions and storage had become a law enforcement concern in itself. Meanwhile, similar proposals for regulation are being drafted in a number of additional US states in preparation for November 2016, though in the state of Vermont it is the legislature, rather than the voters, that is expressing interest in enacting a regulatory model. 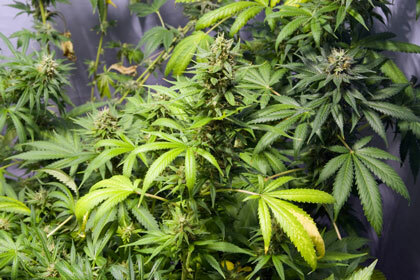 In Uruguay a national law of 2013 allows the state to regulate the supply and use of cannabis through three channels. The law allows for registered users to grow at home, belong to a cannabis social club, or acquire government-regulated cannabis through licensed pharmacies. The law’s stated goal is to reduce the harm caused by the illicit market and provide education and prevention opportunities. All users must register with the state. This is administered by the Institute for the Control and Regulation of Cannabis (IRCCA). Users may have up to six plants in flower in their home, or buy up to 40 g per month from a pharmacy, or join a cannabis club of 15–45 members growing up to 99 plants; again, all growers and users must be registered at the IRCCA. Unauthorised cultivation or supply remains punishable by 20 months to 10 years in prison. While the home and club growing models have become operational from October 2014, the pharmacy supply has been delayed by cultivation issues and is expected to start in late 2016. A more detailed comparison of cannabis regulations in North and South America is published by CICAD, the Inter-American Drug Abuse Control Commission (4). Growing at home Prohibited, but no prosecution if no more than five plants for own use. Not allowed Up to six plants, three in flower (cannot be sold) Up to six plants/480 g Up to four plants Up to six plants Six plants, only three in flower. No more than 12 plants in aggregate for multi-occupier unit. 2. Motion graphic: what is decriminalisation of drugs? Decriminalisation refers to the removal of criminal status from a certain behaviour or action. This does not mean that the behaviour is legal, as non-criminal penalties may still be applied. With respect to the drug debate, this concept is usually used to describe laws addressing personal possession or use rather than drug supply. Depenalisation refers to introducing the possibility or policy of closing a criminal case without proceeding towards punishment, for example as the case is considered ‘minor’ or prosecution is ‘not in the public interest’. Legalisation refers to making an act lawful when previously it was prohibited. In the context of drugs, this usually refers to the removal of all criminal and non-criminal sanctions, although other regulations may limit the extent of the permission. This term is generally used in the context of drug supply. Regulation implies that a set of rules and restrictions is placed around the supply or use of a substance, as is the case for alcohol and tobacco. Regulatory systems usually place limits on access, such as age limits and control of outlets, and may place restrictions on advertising. Penalties for breaching these rules may be criminal or non-criminal. Cannabis social clubs operate on the principle that, if one person will not be prosecuted for cultivating one cannabis plant in private for his or her own use, then 20 people should not be prosecuted for cultivating 20 plants together in private for their own use. Clearly this concept is not without problems. Establishing what constitutes ‘shared’ production, for example, is problematic and there is the general issue of how activities can be legally distinguished from supply offences. Across the European Union, drug supply offences themselves have varying legal definitions but usually require the passing of drugs between persons and some quantity criteria may also apply. In response, cannabis social clubs have tried to establish operating rules in order to avoid charges of trafficking, drug supply or encouraging drug use. For example, the advocacy group Encod (1) has proposed that clubs should operate as a collective agreement, with a register of members, costs calculated to reflect expected individual consumption and the amount produced per person limited and intended for immediate consumption. Clubs should be closed to the public and new members should be established cannabis users who are accepted only by invitation. This model, although promoted by activists in Belgium, France, Spain and Germany, is nevertheless not tolerated by national authorities in any European country. This means that cannabis social clubs are likely to be subject to legal sanctions should they be identified or at best may be operating in a legal grey area. Currently, it is difficult to establish to what extent these social clubs exist in Europe, although they do appear to be rare. The city of Utrecht in the Netherlands announced a project to develop such a club in 2011, but the project has not yet been implemented. Some clubs report that they are operating on a limited basis in some Spanish regions, taking advantage of the fact that, although production, supply and personal possession of cannabis in public are prohibited under Spanish law, possession in private spaces is not penalised. The legal position on shared consumption is more complicated, but in 2015 three judgments from the Supreme Court in Spain concluded that organised, institutionalised and persistent cultivation and distribution of cannabis among an association open to new members is considered drug trafficking.